Mixed layout combination d-sub connectors offer the ability to integrate signal and 50 and 75 Ohm coax, 40Amp power, and high voltage in a standard d-sub shell. The mixed layout Combo D-sub connector combines signal, power (up to 40 Amp), and RF coaxial (50 and 75 Ohm) contacts within a variety of industry standard D shell sizes. 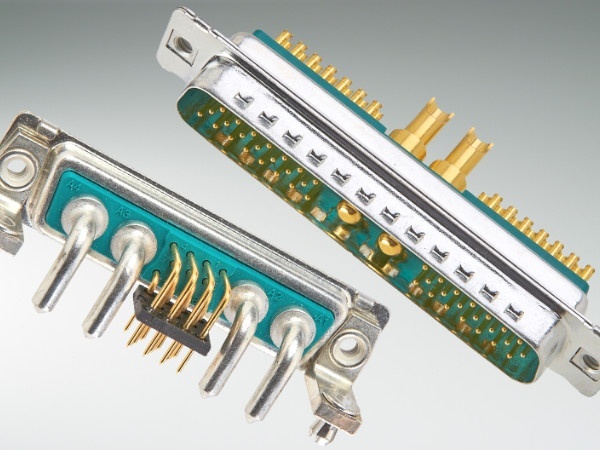 These combination connectors all feature the polarised shielding D shell to prevent mis-mating; high density space saving packaging, and diverse mounting options. Thus the design engineer is offered the advantages of an industry standard shield I/O interconnect, with the flexibility of a customised special, designed for any application. PCB combination d-sub connectors can come with all contacts fitted, eliminating the need to keep complicated piece part inventories and suiting them admirably for use in communication, computer, and test and measurement equipment applications. Because of the wide range of configurations available, these mixed layout combination d-sub connectors are generally built to order, but we will stock against customers’ ongoing requirements. Within the standard range are combinations enabling 2, 3, 5 or 8 x 10A, 20A, 30A or 40A contacts or HV contacts to be used on their own, without signal contacts. These combination connectors all feature the polarised shielding D shell to prevent mis-mating; filter combo d-sub high density space saving packaging, and diverse mounting options. For example the 8 x 40Amp contacts sit in a shell size 4 which is the normal 37 way dsub footprint ~ a very cost effective little power connector. What’s more, in line with most of our offerings, IP67 waterproof power versions are available, both front and rear panel mounting. Filtered and waterproof d type connectors available. A fully shielded connector that both decreases the number of I/O interfaces and reduces the possibility of EMI/RFI leakage. Contact Resistance – < 2.7m Ohm . Blue Bullet Insulation Resistance – > 5G Ohm . Conec has now also developed and expanded the Mixed Layout D-Subminiature Connector Family (known as Combination D-Sub Connectors) by adding High Density Layout Versions. The following High Density configurations are now available: 19W1, 15W4 and 45W2 in straight solder pin and solder cup design. This new series is now available in two variations, unsealed versions for indoor applications and in the solid body IP67 rated version well suited for outdoor harsh environment applications, IP67 in mated condition. The connectors in the solid body configuration meet the IP67 protection grade. If more stringent protection grade is required, please contact us. A variety of mounting options are available, straight and right angle contact configurations are offered. For rear panel mounting the connectors come with UNC 4-40 threaded mounting holes and are supplied with stainless steel hex locking bolts. The series features configurations that can be populated with power, coax, high voltage and signal contacts. Other High Density combo styles can be designed upon request. Typical applications for this series of connectors are: medical electronics, wireless outdoor telecom systems, industrial automation, mass transportation, oil exploration, printers and displays, diagnostic systems and chemical process industries.